The heir to the British throne has taken a Tube with his wife the Duchess of Cornwall for the first time to celebrate London Underground's 150th anniversary. 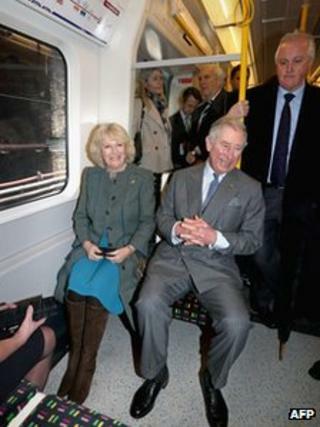 Prince Charles and Camilla travelled one stop from Farringdon to King's Cross on a Metropolitan line train. Charles last travelled on the Tube in 1986 when he and Princess Diana opened Heathrow's Terminal Four. The royal couple received specially designed anniversary Oyster cards. The cards, which had £10 in credit, are expected to be retained by the Royal Collection. Camilla sat opposite Metropolitan line manager Angela Back and speaking about the train said: "Very nice, very smart." A brand new train was used for the journey, part of LU's new S-Stock trains, which are being introduced to 40% of the Tube network. The Metropolitan line was the first to open, on 9 January, 1863, when it offered a service between Paddington and Farringdon.